The last Great Frontier Alaska Glacial Mud is coming to the Shark Tank with what seems to be the Very Best Natural Skin Care Products Mother Earth has to offer. All these natural skin care products are made with real glacial mud harvested from the Copper River Delta near the beautiful town of Cordova, Alaska. Lauren Padawer the owner of Alaska Glacial Mud company started this 100% organic skin care line in 2006 and continues to expand on her success within the luxury market. Not only does Alaska Glacier Mud owner use the purest naturally organic skin care mud probably still left on this earth, Padawer also includes over 60 nourishing trace elements that help promote healthy skin regeneration while detoxifying and softening the skin. Because all the ingredients used in the Alaska Glacial Mud skin care line are all natural, they are all 100% biodegradable free of any fragrances, colors and fillers. As far as the packaging goes, Lauren again went the extra mile and uses only recycled materials. Trying to find any sales figures for Alaska Glacial Mud Co to see how successful Lauren Padawer has already become before her Shark Tank appearance turned up a little information, but what does look impressive is the number of online stores and luxury spas already carrying this product. What other skin care mask product could possibly compete against millions of years old mud harvested from an untouched glacier? It certainly makes sense to me that nature herself "always" has the best solution compared to other unnatural ingredients found in a lot of the competitions. Another positive is Padawer practices what she preaches when it comes to making an all-natural skin care product that's not only good for us, but good for our environment as well. Alaska Glacial Mud Company donates 10% of all profits to wilderness preservation, habitat restoration, sustainable community development and environmental education. 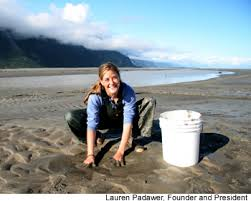 By all accounts I'd have to say that Lauren Padawer and the Alaska Glacier Mud Co. will become a Huge Success on the Shark Tank Show. She's already established in dozens of luxury health spas which no doubt will grow considerably after episode 514 airs this Friday Night. If you already visit a luxury spa frequently, you might want to give them a call and give them a heads up about placing an order asap before the rush begins. Good Luck Lauren, Deal or no deal, I hope you're ready for all the success headed your way! I bought this after seeing it on ST. I absolutely love it. It is so smooth going on and it really makes my face soft. I bought this after seeing it on Shark Tank and wanted to support this amazing woman and the had work she has put into the wonderful product! It makes my face feel great and I love this product. I would definitely recommend it.